I understand the role of bridles when you have an all chain rode. But is any such arrangement necessary if you have a nylon rode? I have 50' of 5/16" chain followed by 150' of 3/4" nylon. When I am anchored, is it ok to just let the nylon rode tie off to the windlass, or should I rig some sort of 3 point bridle and bring the side lines through the openings on either side of the bow? And what are those openings called anyway? Advice is appreciated. On my Mainship 30 I have 100 ft of chain and 150 ft of nylon rode. If I am on chain only I rig a bridle. If I let out enough scope so that I have at least 15-20 ft of nylon deployed I forgo the bridle. The nylon rode will give you shock absorbing capability. I think the holes in the front of your boat are referred to as the anchor hawse holes. As willpep said, the nylon rode will supply you with the shock absorption. On my sailboat I had about 90' (?) of chain and then a couple hundred feet of nylon rode. If I was anchored in shallow water (15'), I would have only chain out. In that situation I used a 3 strand snubber with a chain hook. If I was anchored deeper than 15' I normally had plenty of nylon so didn't worry about the snubber. Not only did the nylon give some stretch, but the increased catenary of the chain helped. I would NOT use the windless to anchor the rode however. Most boats have a cleat or Sampson post by the windless. Use it to secure your anchor rode. Hawse pipes or hawse holes are the terms. Always tie off to a cleat and not the windlass. And you will not need a bridle with the rode, it will stretch and take the strain as it is, plus eliminate conduit noise. 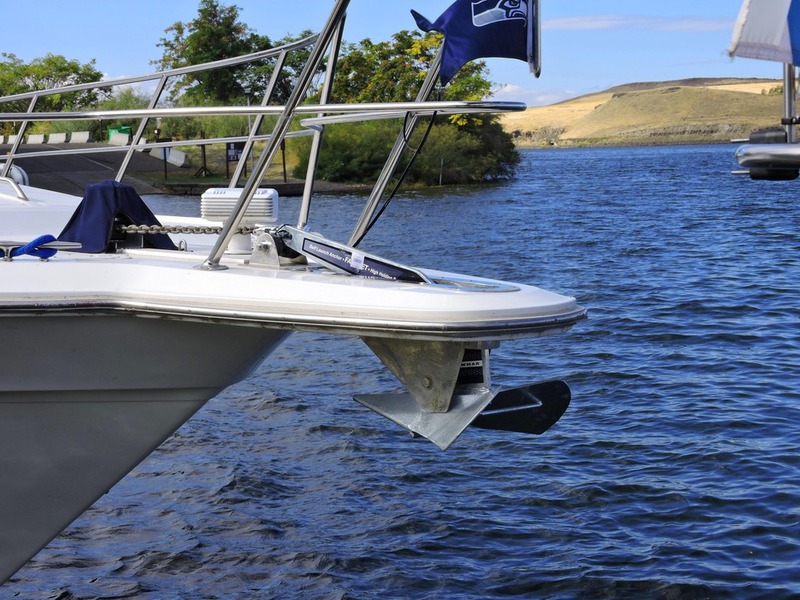 Though you may get noise from the bow roller as you will still experience directional changes and the pull and release of the current and wind. Just make sure to change it out every 5-6 years. You need to have a section of abrasion resistant material to wrap your nylon line where it passes over the roller or through the hawse pipes, called "chaffing gear". The anchor line will wear at the point it makes contact with anything it makes contact with. I use an old piece of fire hose, the point being to keep the nylon from having a wear point. I seldom use the chaffing gear when conditions are calm, as the line stays on the rubber bow roller pretty well, but if it's storming and surging on the anchor line you really want something to prevent wear. I often double up the anchor line passing over the roller, with a "figure 8" knot outside of the roller to make a loop, which reduces the pressure and wear by about half where it makes contact. Almost all of the shock mitigation comes from lifting the sunk rope thru the drag of the water as it gets straight. Nylon does not stretch much till about 10% of its breaking load , which with 3/4 is a very high number. With no stretch any shock loads are passed directly to the anchor , which never is good . The simple solution is a far thinner nylon line , 1/2 or 7/16 to have the nylon absorb much of the shock loads . AS most cruisers will have a number of set up anchor lines , you might experiment with the thin stuff. Yes a couple of hitches , and leaving a loop will allow a 3/8 snubber line to work with nylon storm sized line for a better ride. Nylon is good for snubbers and dock lines, but not so good for anchor rodes. It looses 20 percent of its strength when wet and if spliced with a 3 to 1 thimble eye at least another 10 percent. Best to look into replacement with a polyester rode which you can just cleat off to a docking cleat. Also you always want to protect the windlass from shock loads but especially when you get to that last 50' section of chain and need to break the anchor out. For that you want to at least have a chain hook secured to a cleat, post or bit. Better yet a chain stopper, for those pitching deck retrieval scenarios. Thanks everyone. As for names, I knew that hawse pipe was the vertical hole at the windlass that drops to the chain locker, so "hawse holes" it is for the other bow holes. On Waterthrush, there is a large "box" on which sits the windlass, and from which extends two bow rollers. The box is heavily built solid teak. But on either side of the box are what I think is are very undersized cleats. Sorry I do not have a picture at hand. Those small cleats are not big enough to tie off the rode, so I would be better to run the rode through one of the hawse holes and tie off the very large cleat that forms part of the stainless hawse hole. But then the rode is not running over the bow roller. This would be a lot simpler if I had a Samson post. I'll put this up as an example of how it can be done, but there are many options. This is the one that just seems to work on my boat. I don't have hawse holes, but I have chocks on the fwd caprail. My windlass is mounted on a hollow teak box with a SS pipe for the rode. Fwd of the windlass is a back-plated cleat solidly mounted through the top SS plate. Aft of the windlass is a sampson post. The windlass and the sampson post are stoutly mounted and back-plated. The deck is probably 2-2 1/2 inches thick. My rode is 120 ft 5/16 chain and 240 ft of 5/8 8 ply nylon Brait. Like mentioned above, if the anchorage is shallow, sometimes I'll be anchored on all chain. This is where the snubber comes in handy. On deeper anchorings, if I have 120 ft of chain plus another 50-100 ft of Brait, I'll just tie off to the cleat fwd of the windlass to unload the windlass. There's no need for the snubber since the Brait line acts as the snubber. The white 'leash' seen in the picture is not for anchoring but is a cable to secure the anchor while underway to prevent an unintentional deployment since the anchor rolling is self-deploying. In other words, once chain tension is released, the anchor will roll off the fwd roller without the need for a push by the crew. Aft of the sampson post is my recessed washdown hose canister. Be sure whatever you secure your rode to is very securely mounted with backing plates. If your cleats are undersized or not properly secured, it might be an east remedy to upgrade. Do you have access to the area behind/under the cleats? As always a picture is worth a thousand words. 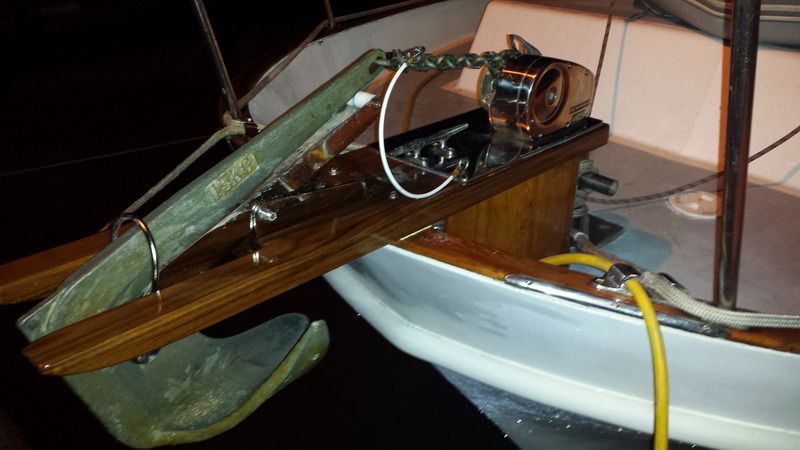 Our setups are generally similar except my teak box is twice as wide, with 2 rollers, and instead of one cleat in front of the windlass I have one wimpy one on ether side of the teak box. The wash down connection is inside the box - there is a door on the box facing aft. We actually have the same primary anchor. The big difference is my lack of a samson post. I am starting to think I should install one. As things stand right now the strongest "tie off point" I have is the large stainless cleat that forms the fitting around each hawse hole. Al and Dave, I have a question for you (or any others). Let's say you have lowered the anchor and it's set and you want to attach a bridle that would then be attached to your deck cleats on the other end. Do you reach out around the pulpit to get the chain grabber or whatever you're using to attach the bridle to the anchor chain? I did, either by reaching through the chute or around. Most of the time I could get the chain plate type "hook" on with a little finesse and not have to place it directly by hand. 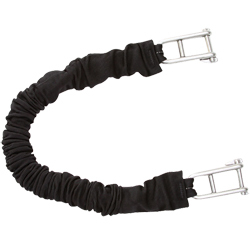 When you go to buy an anchor line, it is likely to be nylon. You will have a hard time finding polyester already made up as an anchor line (rode). And it will float which is a bad thing. Polyester degrades in sunlight. Nylon is what is typically used and is what I use and would recommend. Actually, WesK, polypropylene is the line used for water skiing etc because it floats. Polyester, aka Dacron or Terylene does not float, Polypropylene is not particularly UV resistant. 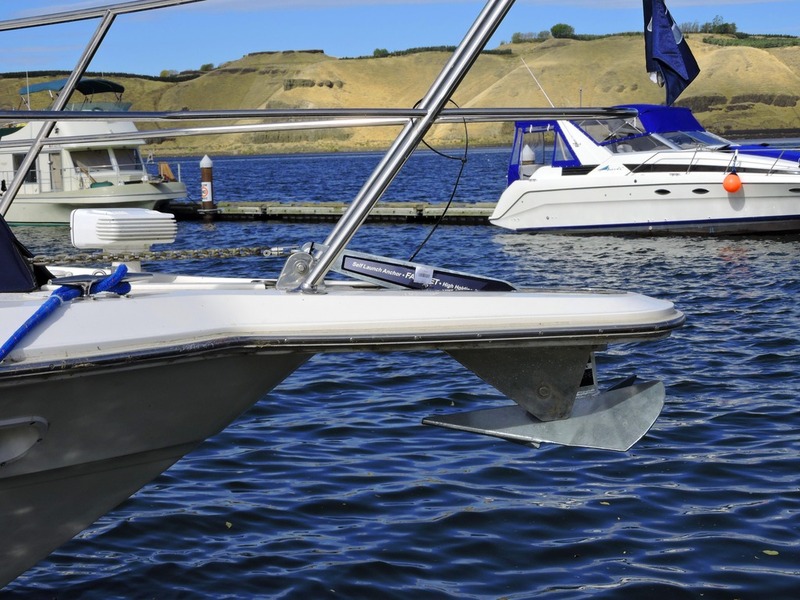 Polyester is UV resistant, which is a good thing since most of our boats are polyester resin. I don't know why polyester is not used for anchor rodes. Mine's a bit simpler than most here. I have a single line as my snubber. On one end it's got your average, run-of-the-mill chain hook. On the other, it's a 20 ft 1/2 nylon 3-strand line. In the middle is one of these Davis Shockles elastic snubbers. To deploy, I set the anchor then hook the snubber between the windlass and the anchor roller. I feed out the chain and the hook, snubber and line pass through the bail and over the roller, following the chain. When the length is about right, I cleat the line and release another foot or so of chain to load the snubber and unload the chain. It's set so that the chain takes up load as the snubber reaches its max extension. Here's a video of a guy deploying his on his chain. I don't like this method because it fails to unload the windlass. In real life, I only need to deploy this in shallow anchorages of less than 15 ft. Beyond that, I release all my chain (120') and an additional length of 5/8 Brait and tie off on the cleat so no snubber is needed. Most of my anchoring is in 20-35 ft. I looked at the video and that thing doesn't do much to relieve the strain on the windlass. I think the centenary action provided by the weight of the chain would do a lot more to reduce "snap" than that thing. We typically anchor in 20'-35' depths like you do, but we have a ~3kt current to contend with. Needless to say we don't swing on the anchor when we're in the river, we're held straight downstream from it. I'm thinking ahead with my questions to when we take the boat up to Canada. I want to be able to attach a bridle to take the load off the windlass, but I don't see an easy way to do that with my pulpit setup. I would have to lower the anchor then reach around the end of the pulpit to secure any kind of chain hook. That looks like a PITA and would not be fun if there were any kind of wave action going on. Any thoughts from anyone on an easy way to attach a chain hook? Either I didn't explain it well or you didn't read the whole post. I don't hook mine as shown in the video. I connect it as explained in the post to relieve the load on the windlass. Maybe I'll make my own youtube video to get the point across more effectively. There's some photos on the anchor flapper thread. Or you could try something simpler like a preventer.